A couple of months ago I ran into an article lamenting the poor visibility of female authors in the field of sci-fi, especially new ones. It made me go “Pfft, that can’t be right! Of course there’s a lot of new female sci-fi authors I know, like… umm… uh oh.” This was definitely a situation that required fixing. I have a lot of sci-fi and fantasy fans in my (online) circles, so I posed them a question: give me your list of the most interesting female sci-fi authors from the last 10 years. I got a bunch of names, and amongst them a couple of strong suggestions to check out Lauren Beukes‘ Zoo City and Moxyland. That turned out to be the most interesting dose of cyberpunk I’ve read in ages. I started with Zoo City, and the first thing that grabbed me is the setting of the book. With cyberpunk, US feels like it has been done to death as a setting. Nevertheless it’s surprising how damn fresh it felt to read a story that takes place in the South Africa of the near future. Especially so since Beukes didn’t make the books a tourist trip for the dumb where all the terms, ethnicities and slang words were faithfully explained in a gush of exposition so that even the slowest reader stayed on board. Instead you got a faceful of unfamiliar terms and you just had to trust that they will be explained sooner or later by the context – and this is a good thing. It made the setting feel really exotic and different for a reader imbued with the American and British sci-fi culture. Both Zoo City and Moxyland take place in South Africa, Moxyland in Cape Town instead of Johannesburg. In spite of that, as far as I can tell, they are not in the same continuum and thematically they are quite different. 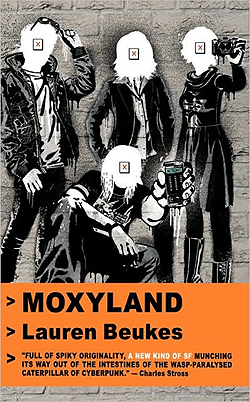 Moxyland is set in the pop and corporate culture of the fictional world. The characters are a future version of an egotistical fashion blogger type, a street level socio-political anarchist, an art school dropout who becomes a corporate sponsor baby for a soft drink brand (which is an commitment that goes as deep as your DNA), and a hot shot programmer clambering up the corporate ladder. The story is about social activism, corporate power over the society, fame, pop-culture and video games. Standard fare for cyberpunk, yes, but done with a twist. Zoo City is a completely different animal (pun hard to avoid), since it dips deeply into magical realism. I’m not sure if it was the author or someone else who coined the term muti noir, but it fits the book perfectly. In the world of Zoo City those who commit a serious crime get paired with a magical animal familiar, with whom they are inseparable, and this makes them the pariah of the society. In addition to “animalled people” there are some other clearly unnatural elements in the world of the novel. Thematically Zoo City is a pretty traditional film noir detective story that uses the tropes of the genre quite beautifully. Some of the people who recommended the book to me complained about the ending being slightly abrupt, but I don’t really agree – a big part of that was probably the book ending before the book was physically finished, since there was some extra material in the end. What makes Beukes’ text so riveting to read for me is that first of all the lady knows her geek stuff and pop culture. There are references to real world stuff, but they don’t sound contrived in that annoying “hey look, I did a bit of research” way, being instead very organic and natural. Mix the recognizable current day stuff with the near future pop culture, art shows, music business, reality shows, advertising and video games – and of course the South African setting that’s a world unto itself with the ethnicities, conflicts etc – you get a pretty damn nice, believable and appealing mix that makes the world of the stories feel rich and real. Neither of the books are of course without their faults, but compared to the good stuff the flaws are relatively minor and can be plastered over by a small extra application of SoD. 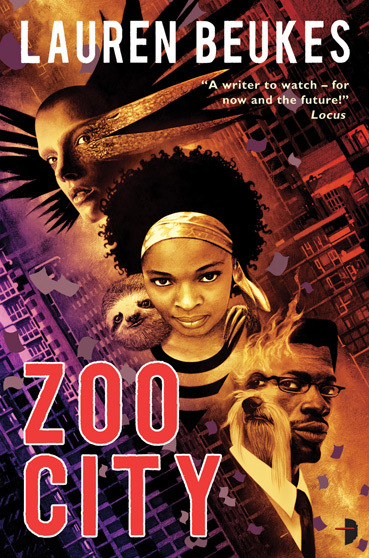 tl;dr; Go and read Zoo City and Moxyland by Lauren Beukes – someone took cyberpunk from the toy box, dusted it up and spanked it to shape for the new millennium.